A regional daily has been revived in the form of a special printed edition a little over a year after it ceased publication. 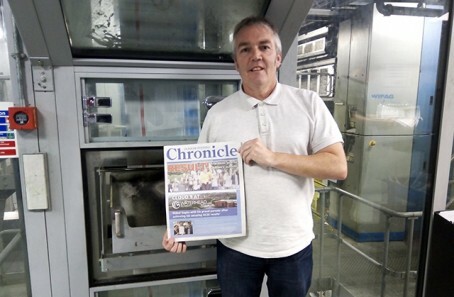 The Oldham Evening Chronicle has returned as a print publication for the first time since August 2017, when 49 jobs were lost at the newspaper after owner Hirst, Kidd and Rennie Limited went into administration. The Chronicle has since been revived as a digital-only news operation under new owner Credible Media, but a publication bearing its name has now also rolled off the presses in the form of a special education supplement. The Chronicle Open Days supplement highlights the best of Oldham’s Secondary Schools and Sixth Form Education organisations, and around 10,000 copies are available for free. A piece about the supplement on the Chronicle’s website states: “The special supplement will allow Oldham students, their parents and carers to make an informed judgement as to where their next five, or more, years will be spent in their most important learning period. “Readers can hear direct from the heads andpPrincipals as we take a closer look at not just the recent results from the GCSEs and A-Levels, but also what pastoral care and extra-curricular activities are available to prospective students. “As this is the first printed newspaper that we have produced since the demise of the old Oldham Chronicle, we hope you agree that the paper is informative and interesting, even if you are not looking for a school to attend.